Your go-to guy for no-nonsense goalscoring – Chris Minard. After a brief slump at the start of the season the Canadian is back to scoring like clockwork. 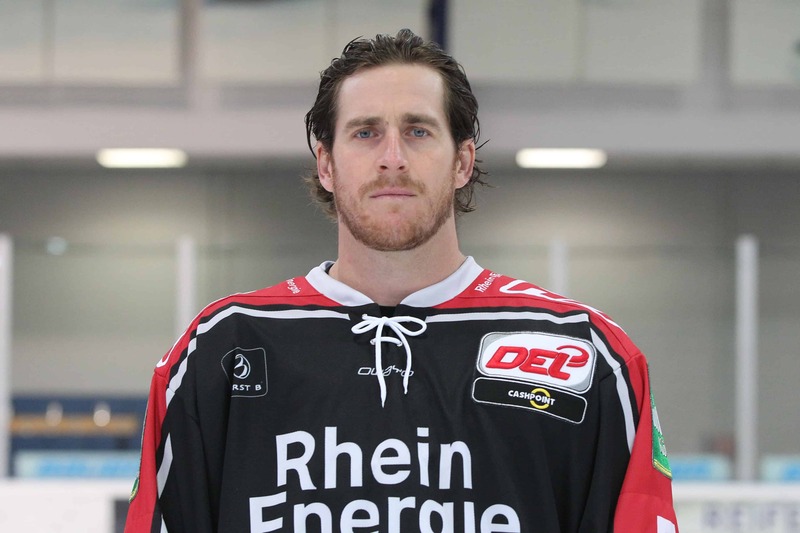 He started his second season as a Cologne Shark with a lot of momentum and is currently playing some of his best hockey to date. For the german translation of this interview click here. Chris, finishing on a high note before the break, looking at the standings – what’s the mood like in the locker room these days? It’s good! Everyone has got a lot of confidence. It was nice to get away for a few days and not seeing each other, but it’s good to be back. We’re all ready to play some hockey again. Did that loss against the Schwenninger Wild Wings come at the right time before you guys got a little too confident? You never want to play a game like that, but hockey is a weird sport. You can’t win every game. And sometimes you don’t play at your best. That was one of those games, that we didn’t play well. We know we didn’t play well. But I think we regrouped the right way in Straubing. Does going at this pace feel a bit like overachieving or do you think the team can keep up this level of performance throughout the season? I think, you know, we don’t look at it on the long run. We just take it day by day. But as long as we prepare well for every game and we work hard during the weeks, we can keep doing the things that we’re doing. How much of a difference was approaching this season compared to last season for you? It was a lot easier. I knew what to expect. I knew what the league was like, what the environment around here is like, the coaches, the players. It was much easier for me to come in this year. Last year I wasn’t familiar with anything, trying to get to know everyone and trying to fit into the team concept the way you’re supposed to. This year you just come in, you know everything that’s going to happen, so you just work hard and try to play your game. Did you change anything in terms of conditioning or summer work-outs? Not really. I just tried to lose a little weight, so I could be a little quicker on my skates. I tried to improve my skating a little bit. But other than that, nothing really that I changed. I just followed our fitness guys’ programme pretty much to a t every day. Coming into the league last year you had to build a reputation for yourself. Did you do anything about your game in order to accomplish that? Not really at all. Obviously with my concussion issues in the years past I don’t run around and hit as many guys as I normally would in North America. Maybe I changed my game that way a little bit. But you don’t really need to do that in Germany. There’s so much ice out there. You can easily run out of position, and you don’t want to do that. You’ve still got to finish your checks, but mostly I concentrate on moving my feet, getting to the net and shooting. Those are the things I concentrate on. … You never seem to miss out on an opportunity to make your presence felt there. It looks like you’re really enjoying delivering that extra shove or extra punch after the whistle. Is that something you need to get you going or to get you into the game? Sometimes, yes. (laughs) Sometimes you go into the first period and you feel like your half sleeping out there, so, yeah, I guess you could say sometimes it gets me involved in the game. I try to get to that area and maybe get a scoring chance, maybe give the goalie a little whack, or maybe give a little push to the defenseman. Trying to get into a battle to try to get into it. Definitely when things aren’t going well I gotta try and get there and get involved a little bit. Are you aware that sometimes those defensemen have 4 inches and 20 pounds on you? Don’t you mind? Oh, I know. (smiles) But sometimes you just gotta do what you gotta do. Sometimes that’s the challenge. Everyone likes a challenge! Talk a little bit about your chemistry with Andreas Falk. What makes you guys match so well? I really don’t know. I think his competitiveness. We both work pretty hard. I think I can read off him what he’s going to do with the puck. I can see the plays that he’s going to make or what he’s going to do. We’re playing together now for the second season. I think there’s been one game where I haven’t played on the same line with him. You’d have to ask him that question. I’m a little more difficult to play with than he is. You became a fan favourite pretty much instantly when you joined the team last season. Did you realize that? And do you enjoy the appreciation? I didn’t really know I was a fan favourite, but that’s awesome. I think everybody wants to be liked by their home crowd. So, yeah, that feels good. I figured all the fans like everybody the same. You see a lot of different jerseys and mine is just in the mix. At the start of the season you went five games without a goal. How much did that bother you at the time and how much of a relief was your first of the year you scored in Berlin? The first one was a big relief, only because we played so well in exhibition. Points-wise Falky and I were doing ok. We were getting points, we were scoring goals. I’m not going to lie, going five games without a goal was a little tough on me. But I knew eventually it’s going to come. I don’t think it was affecting my game, because I was working hard and playing pretty well. It was just pucks weren’t going in or I wasn’t getting the shots that I wanted. It was good to get that first one, for sure. The thing is, as long as you’re getting chances, you can’t get mad. It’s the games where you’re not getting those chances when you feel like you’re not doing your job, you’re not playing well, you’re not in the right spots, you’re not working hard enough. You’re a shoo-in for top line minutes here, opposed to the constant battle for a call-up job in North America. How much more at ease are you due to that and what impact does that have on your game? That’s one difficult thing playing back home. You’re in the Minors, you constantly try to outplay everyone else on your team so you can get called up. Then you do get called up and your mindset has to be that you belong there to play well enough to stay there. That was always hard for me to do. So here it’s a little more relaxing, but we have such a good team. I don’t think you could say I’m a top player. We have three, four lines that are all good and we all play well. I’m lucky that I’m on such a good team. If you have a bad night, there’s going to be another guy that picks you up. You had pretty specific expectations regarding the league and the game in Germany: More space on the ice, less hitting. Did it turn out to be everything you were hoping for or were there any surprises? The league is a lot better than I expected. I didn’t expect it to be as fast and skilled. I really didn’t know anything about European hockey. It was all different to me. The first month really shocked me with how good everybody was. Was signing that two-year contract extension a no-brainer or did it take you a long time to consider it? No, we didn’t talk about it for long. The family decision was a big part of it and whether or not I wanted to go back to North America to give it another shot back there. I think that was always in the back of my head, whether I wanted to do it or not. Obviously if I was going to stay in Germany, signing with Cologne was a main priority. We really like it here. It’s a great city. A couple of weeks ago I happened to watch your first NHL goal and I was thinking, yes, that’s vintage Chris Minard. Has your style been your style since forever? I’ve never changed my style. I tried to improve my stickhandling a little bit but it has never worked. (laughs) I pretty much go to the net and shoot pucks. I’ve done that since I was a little kid. It’s just what I like to do and enjoy doing, I guess. Speaking of you as little kid: Since your brother Mike was a goalie I’d imagine your childhood consisted a lot of you trying to get pucks past him? We played a lot of roller hockey as kids, but he is five years older than me. He was off playing junior hockey by the time he was fifteen, so he wasn’t really around much. So, we played roller hockey quite a bit when we were younger, but on the ice not so much till my late teenage years or my early twenties, when we would actually get on the ice together. But then it was a battle. How much of a role model was he for you? Big time. I always looked up to him. He moved out when he was fifteen. To me he was the biggest star. I wanted to be just like him. I remember travelling with my parents all the time to go watch his games when he was playing junior. Even when he turned pro he was just a couple of hours away in Hamilton. We’d always go and watch him. I always wanted to be like him. You went undrafted while he was a fourth round pick by the Oilers back in the day. Was that a tough pill to swallow, that you didn’t get the recognition he got? I don’t think of it that way. I was so proud of him when he did get drafted. He wasn’t supposed to be drafted, either. One team liked him. All it takes to get drafted is one person to like you. You know, I was disappointed obviously. I didn’t have the best of years. I got traded in my draft year and things didn’t really work out after that. But definitely not being drafted was a disappointment, and so the next year you come back and you want to prove people wrong. I think I did that in my last year in junior. I opened some eyes. You worked your way up into the NHL. Do you remember what it was like when you finally got there? It was an unreal experience. Especially with the way I got there. ECHL, CHL, then ECHL for a couple more years, then another year and a half in the AHL. It was awesome. The day we got called up there were three of us. One of the guys and me, we’d never gotten called up before. They organized a driver for us that drove us from Hershey to Pittsburgh. We were just on the phone the whole time. We were just so happy and excited. The third guy, he has been through it before, so he was just calm and laid back. I think he was a little annoyed by us because we were so excited. It was an awesome experience. My first game was against Ovechkin. It was amazing. You just sit on the bench and watch. But that’s the thing. When you get to the NHL, some people just sit there and are in awe. But the people that stay there, their mentality is that they deserve to be there. I think that was a big part for me. I was too much in awe. I just sat back, watched and was just happy to be there, you know, instead of pushing through and trying to stay there. It’s hard to get used to it. It wasn’t before my second year in Pittsburgh when I thought I was playing well enough to stay there. It’s hard to feel comfortable, because when you get called up you know you’re just there to replace someone, and you never know when you’re going back. The longer you stay with the big team, the more comfortable you get. What was it like to be with the Pens organization during their Cup run? It was awesome. I can’t find words to explain it. You’ve got two of the – probably – ten best players in the world. It’s just an unbelievable organization to be around. It’s all about winning and a winning atmosphere. It was great. You were born and raised in Owen Sound, Ontario. That’s Leafs territory. But you were a Red Wings fan growing up? Yeah, I grew up a Red Wings fan. Detroit is only four and a half hours, Toronto is two and a bit. Steve Yzerman was always my favourite player to watch. And the family I used to hang out with, they were Red Wings fans, too. I never really liked the Leafs until the last few years. Now I’m becoming a Leafs fan. It’s weird. Was that tolerated in your family? Yeah. My brother was a Leafs fan, I think. My father was a big Blackhawks fan, though. Hockey is obviously running in the Minard family. So, what’s the scouting report on the next generation, namely your son Chace? He’s going on the ice in about five minutes. He’ll be here any second to put his skates on. He loves it. He loves playing. He loves the game. I don’t know how many hours a day I spent playing mini-sticks with him. He loves to shoot pucks. He loves to run through the house pretending he’s skating. He loves coming to the games. He’s been like that ever since he was born. Ever since he could walk or crawl he had a stick in his hands. I try not to force it on him, because I get enough of hockey being here, but it’s fun watching him have fun. So if he wants to play I’m all there to support him. How proud would it make you if he’d follow in your footsteps? That’d be awesome. Who wouldn’t want their kids to be professional athletes? Or have a dream one day and live that dream? We would like to thank Chris Minard for this interview!